As English learners in LA Unified continue to post little to no growth on state tests, the district this year has a new strategy to help students become proficient in English. Struggling English learners have started getting individualized reclassification plans, similar to the plans known as IEP’s that outline the needs and supports for each student who receives special education services. The new plans will detail how far along a student is toward reclassification and what’s needed to get there. Reclassification allows a student to learn alongside their peers in regular classes, and in high school it gives them access to the critical A-G courses — the set of college-prep classes that are required for access to the state’s public universities. To reclassify, students need to complete a four-step process that includes passing a state test. With the new plans, “we will have the documentation about what we are going to do, what are the strategies to help you reclassify sooner. If you become a long-term English learner, let’s figure out what’s happening between home, the classroom, and the big school piece to support the child,” said Lydia Acosta Stephens, the new head of the district’s Multilingual Department. Los Angeles’s English learners had the lowest proficiency rate of any group in test scores released by the state in October. Less than 4 percent were reading on grade level, and less than 6 percent could do math on grade level. This year they showed no growth at all in reading over last year, and their math scores inched up by only a minuscule 0.04 percentage point. Only half the district’s English learners graduate from high school (51 percent), a lower rate than for students receiving special education (55 percent). Overall, the district’s 2018 graduation rate was 76.6 percent, according to just-released data from the state. The district’s goal is that students reclassify before they reach their sixth year trying or before they finish elementary school if they entered kindergarten as English learners, Acosta Stephens said. The district has been steadily increasing its reclassification rate, which rose to 20 percent last year from 17 percent the previous year and 12 percent in 2015-16. It has also topped the state’s rate for each of the last three years. This year’s goal is 22 percent. She said that about half the district’s long-term English learners also receive special education services. Altogether, English learners, including those who have reclassified, make up almost half — 48 percent — of the district’s nearly half a million students. Almost 20 percent of all English learners are long-term English learners. This year the district wants to lower that to 15 percent. 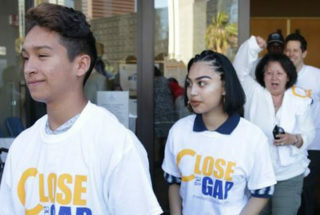 The commitment to providing all long-term and at-risk English learners with individualized reclassification plans was laid out in the “Realizing the Promise for All: Close the Gap by 2023” resolution that the board unanimously approved in June. The resolution states that students, including English learners, will graduate eligible to apply to a public four-year college by 2023. 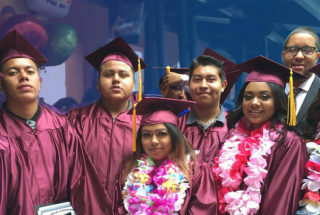 Promesa Boyle Heights, a local organization that was instrumental in that resolution, has been working in three LA Unified schools to help boost English learners’ graduation rates. With the resolution, “For the first time, the district is developing and setting very ambitious goals for the reclassification of English learners, long-term English learners, and for supporting newcomers — English learners and special education English learners. That’s the reason why we at Promesa got involved and played a role in pushing and drafting this part of the resolution,” said Deycy Hernández, Promesa Boyle Heights’ executive director. Sometimes what holds English learners back from reclassifying sooner is a social-emotional issue, Acosta Stephens said, and Hernández said Promesa has found that to be true in its work during the last seven years at Mendez High School and three years at Roosevelt High School. Seven years ago at Mendez High, only 40 percent of English learners were graduating. After Promesa started providing targeted intervention by offering extra tutoring and individualized social support, it steadily increased, reaching 91 percent in 2016-17. At Roosevelt, English learners’ graduation rate has gone from under 20 percent in 2010-11 to 60 percent in 2016-17. Hernández said for English learners in Boyle Heights, a neighborhood in East Los Angeles with the highest concentration of English learners, students’ learning is impacted by their social struggles. “Many times they feel socially isolated from the school and from their peers,” she said. This year, Promesa was awarded a GradNation Acceleration Grant, which will allow it to expand their program to include students at Boyle Heights High School and to focus primarily on increasing the graduation rate for long-term English learners and students who recently arrived in the U.S.
As part of the grant proposal, Promesa Boyle Heights is committing to raise the graduation rate for English learners to 95 percent at Mendez and to 70 percent at Roosevelt by 2019-20. She said Promesa is also working with the district to develop a micro-credentialing program for teachers who work with English learners. Teachers would receive extra professional development to prepare them to meet the specific needs of these students, and having that credential would protect them in case there are layoffs. “The reason why I’m excited about (the ‘Close the Gap’ resolution) is because it targets all the different things that we started to engage in, but now it ensures that we continue this process,” said Acosta Stephens, who also encouraged parents to start talking about the new plans with the English learner coordinators at their schools.